Study the sun and wind patterns. You might want to place a patio on the west side of the house, but it will get lots of afternoon sun, which means dinnertime in August won’t be relaxing — just hot. And wind whistling around a corner will quickly extinguish a fire pit. Those are common mistakes in landscape design for beginners. Your design should take into account what the sun and the wind do at different times of the day and year. “You’ll need solutions to temper the problem,” Lipanovich says. Workaround a focal point. Any good garden design has a focal point or series of focal points, and it’s an easy principle to put in place in landscape design for beginners. That may be a sculpture or a stunning plant, a tree, or a series of shrubs. “The point is to draw your eye and move it through the landscape,” Lipanovich says. 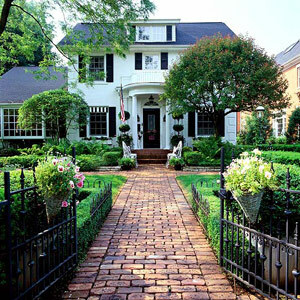 Remember: Patience is key to landscape design for beginners. If all of that bare space is too much to look at, and the kids and dogs are tracking in mud, rely on temporary solutions — annuals, fast-growing ground covers that you don’t care about for the long term, even mulch — to cover an area while you’re figuring out what you want. 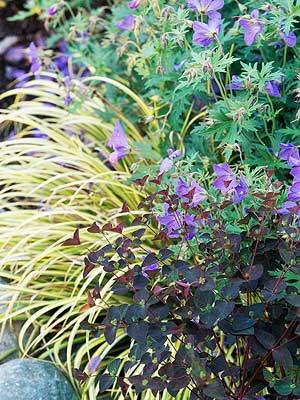 “Large landscaping features like trees can be hard to move; annuals can be taken out, and small perennials and shrubs can be transplanted if you realize they’re in the wrong spot. But in the meantime, you have something out there,” Lipanovich says.